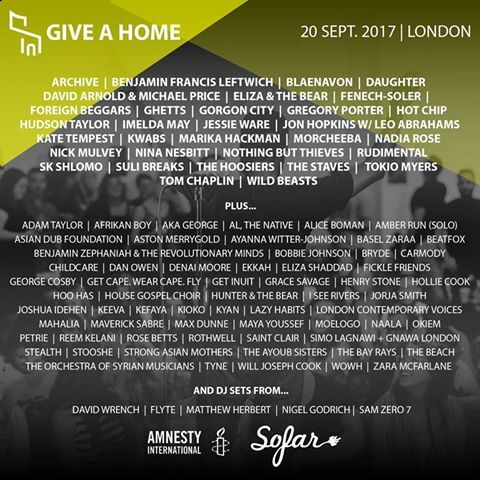 LCV will be taking part in the world's largest global festival – Give A Home, with Sofar Sounds and Amnesty International. 300+ gigs will take place in over 60 countries in one day, in support of 20M+ refugees worldwide. Artists involved include Ed Sheeran, Hozier, Daughter, The National and Hot Chip. At tomorrow's gig not only will LCV perform our own set, we’ll also sing with massive rock band Deaf Havana for a special song and perform with Amber Run! The brilliant spoken word poet Suli Breaks will also be performing some word wizardry. Great music for a great cause!